VenueGen said today that it’s taking its 3D virtual meeting tools to a new audience, with a version aimed at freelancers, small businesses, bloggers, and do-good organizations. Company president Jeff Crown said that most of the existing virtual world products for businesses, such as those offered by Inxpo and Unisfair, are out of reach for smaller organizations, because they cost tens of thousands of dollars per year. And VenueGen’s initial service, which it launched at the DEMO conference coproduced by VentureBeat, was similarly priced for large enterprises. But with the new VenueGen Thunder, the pricing starts at $90 per month, and companies can also apply for a free three- to 12-month trial. 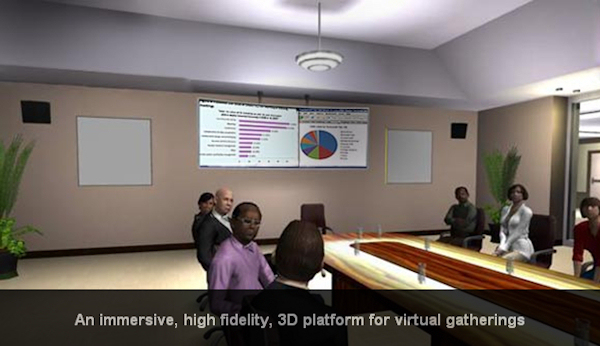 Rather than requiring organizations to work with VenueGen to build the meeting environment they want, companies can just pull one off the virtual shelf, with prebuilt environments ranging from conference rooms to Roman coliseums. Many of these smaller organizations will only need to use VenueGen for a month or two at a time, for one-off events, Crown predicted. For example, a nonprofit group could hold a rally supporting its cause, or an industry trade association could hold a nationwide meeting. Small businesses can also bring their employees together in a virtual meeting room, while freelancers can connect with their clients. I had some doubts about the usefulness of these 3D meeting rooms, but many of those were dispelled when Crown gave me a demonstration of the product. The company, based in North Carolina’s Research Triangle Park, has really nailed a lot of the details, like making the sound reflect where characters are in relation to you, making it easy to adjust your character’s gestures to show your emotion, and naturally integrating presentations and other documents into the virtual rooms. Sure, you could just hold a web conference via a tool like Cisco’s WebEx, but Crown said that’s so much less engaging, and participants are often bored or distracted. VenueGen has raised $2 million in angel money.